Click the picture to explore inside ! Regular entertainment and lots of traditional and contemporary music sessions. Sunday night Quiz and free food. The Manor House is shown on an 1851 map of Otley. In 1857 it was occupied by John Clarke who was a confectioner. It was first licensed in 1860/70’s and the first Inn Keeper, who also owned the property, was Henry Pullan. In 1911 the Pub was only at number 7 Cross Green but took over the adjoining property number 9 at a later date. In March 1931, it was announced in the local press that Mr. Fred Paley, landlord of The Manor House Inn for over 20 years, had died. The inn was the last survivor of the days when public houses were owned by private individuals and was the only “free house” in the town. In 1941 it was taken over by The Tower Brewery which became Hammond’s United Brewery. 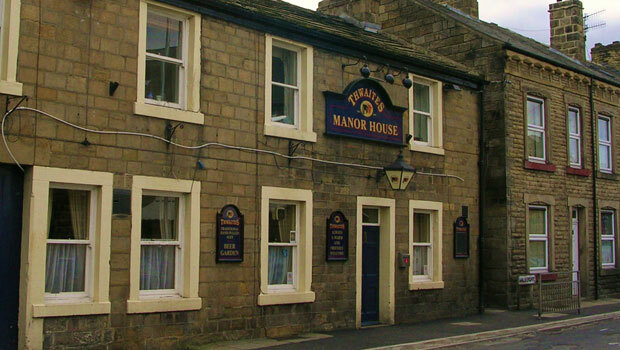 Over the last several years, the pub has added a beer garden which is accessible through the large wooden gates, and in 2006 The Manor House won Camra’s most improved pub in spring 2006.